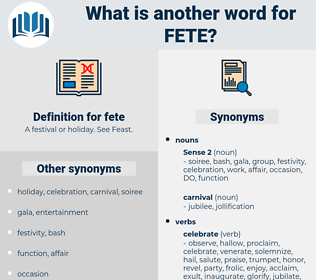 What is another word for fete? 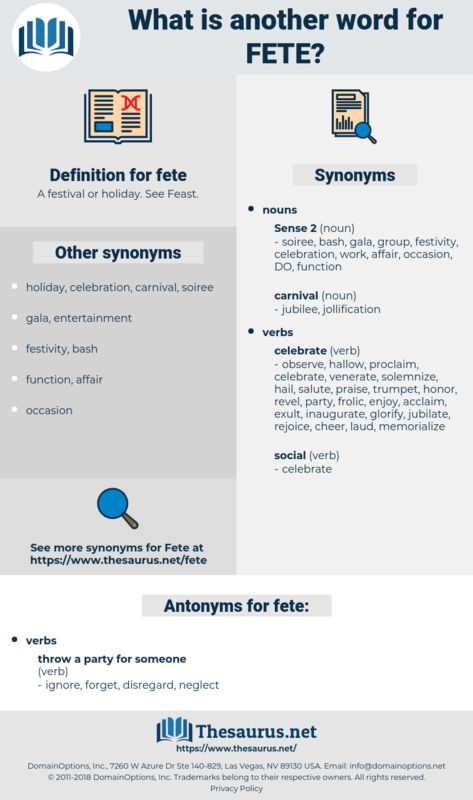 A festival or holiday. See Feast. But Patricia resolved that they should have a grand fete in the Maitland home before Annette should leave it.
" We must have a little fete," he said. fatwa, fate, Fatihah, food, Fet, fado, fete day, fiat, fuddy-duddy, feat, fade away, fatheaded, fda, fad, fit, fifth, fahd, fitted out, feed, fifty, fated, faith, fade, faded, fatty, fatwah, fit out, Fatah, fifty-two, foot, FPD, fadeout, fathead, fiftieth, Fatiha, foetid, faddy, fed, ft, footed, fade out, fat, fad diet, feight, feud, fetid, FAIT, fatuity, foodie, FTO. revel, jubilate, party, racket, make merry, make happy, wassail, jollify, receive, whoop it up, Make Whoopie.